AT the Sydney Theatre Awards no one need ever fear a journalist asking them “who are you wearing” or indeed have any need of a stylist. There is no red carpet at the Paddington RSL, there are no TV cameras. The proceedings could be described as low-key, or even a little bit daggy if you wish, but it is always such a happy night. Yes, theatre practitioners are in competition with one another for our awards – I’m one of the Sydney critics whose votes determine the winners – but there is great warmth and good will in the room. As Belvoir’s new artistic director Eamon Flack said on Monday night when the awards for 2015 were announced, this is the one occasion when the industry gets together. It’s also an occasion on which the tables are turned, slightly, on the critics, as we troop onstage to introduce presenters, ask those present to remember colleagues who have died in the past year, announce special awards and pay tribute to all the theatre workers who never get awards but whose backroom toil is essential. We’re always frightfully nervous about getting up in front of a room of theatre professionals but they are very kind. This year’s highlights included passionate state-of-the-arts speeches from Flack and from Griffin’s artistic director Lee Lewis; a fantastically funny version of My Favourite Things specially written for the occasion by Dash Kruck and performed by him; a gorgeously heartfelt acceptance speech from James Millar when he won best supporting actor in a musical for his Miss Trunchbull in Matilda; Esther Hannaford’s performance of I’ll Hold On from the Nick Enright-Max Lambert musical Miracle City that got the audience to its feet (Lambert was on piano); and the bright presence of the four little girls – Molly Barwick, Sasha Rose, Georgie Taplin and Bella Thomas – who shared the role of Matilda and received our Special Achievement Award. The Lifetime Achievement Award was accepted by Christine Dunstan, a woman steeped in many aspects of theatre for more than 50 years since starting her working life as an assistant stage manager. She founded her production company CDP in 1993 and it has been particularly active in making high-quality theatre for children. (CDP won the 2015 Sydney Theatre Award for best production for children for The 52-Storey Treehouse.) CDP also takes productions to many regional Australian centres and tours productions internationally. I’M sorry. I make no apology for the following revelation because it’s relevant. I was the intellectual of the Kindergarten class at St Columba’s, Ballarat North. I could read before I started school and thus, when the teacher – not a sympathetic one, I fear – took us endlessly through a huge alphabet chart on the wall (A apple, B bat, C cat and so on) I thought I would go mad. I can still see it, and shall we say this was some small time ago, when we all sat in rows at wooden desks with inkwells. I also had a lazy eye and zero coordination. Being chosen last for rounders was a given, and in the foot races we were forced to take part in I always came last. Unless Helen Sherry was in my group, and then I came second last. What balm, then, Matilda the Musical is for little girls and boys like me, and for me too these many decades later. Those memories are forever green, unfortunately. Tim Minchin so gets that. Take one of his early songs in Matilda, School Song, in which the alphabet is trawled to build up to a climactic: “Just you wait for Phys Ed”. That not only gets Z done and dusted in sensational style, it speaks to the monumental terror so many of us felt when forced to get our heads out of a book and our puny bodies on to the sports field. The humiliation was intense and complete. The staging of this song piles Pelion on Ossa (classical reference!) by having the senior students played by adults. Remember how big the big kids looked when you started school. It’s that, magnified. All this happens shortly after a rousing opening number in which Matilda’s youngsters boast of just how marvelous their parents’ think they are. They are in for a shock. Minchin, Dennis Kelly (book), Peter Darling (choreography), Rob Howell (sets and costumes) and Matthew Warchus (original direction of this Royal Shakespeare Company production) create wonders from Roald Dahl’s story. 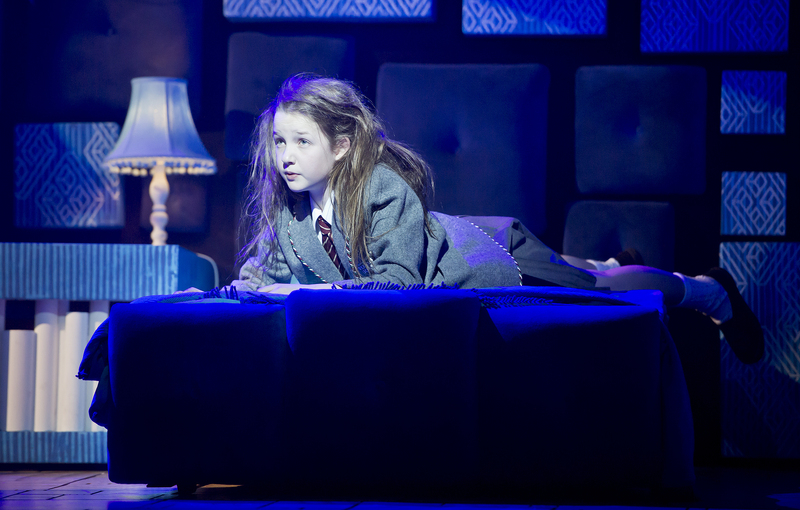 Matilda is exhilarating fun while being very, very brainy. Books, language, courage, resilience and imagination are celebrated as weapons of rebellion against the philistine and the mean-spirited. There’s an inescapable darkness in Matilda but a beautiful spirit of optimism prevails. It’s magical and it has something to say to everyone. 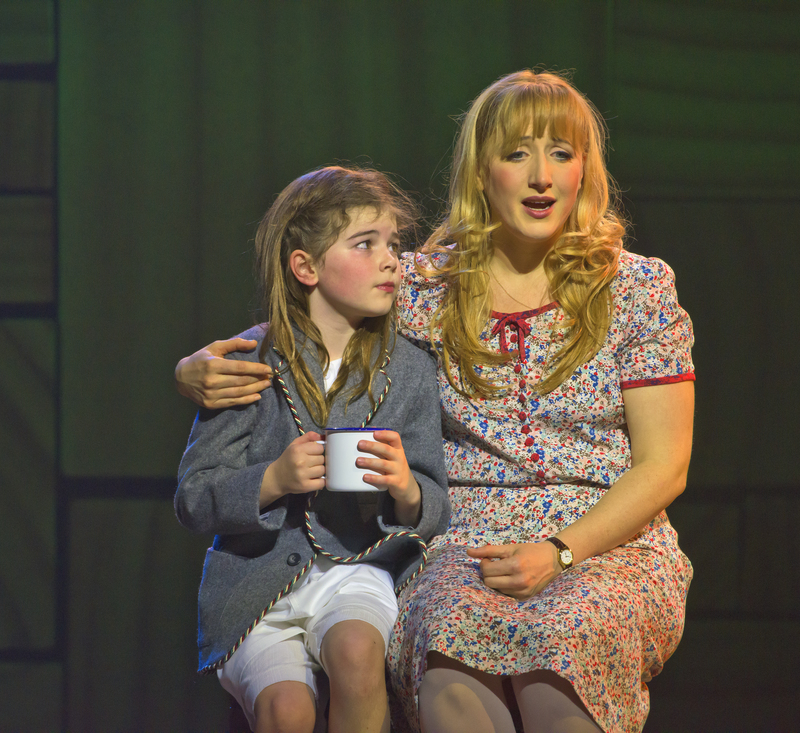 Given the subject matter, Matilda the Musical has to rest its case on small shoulders. There are superb performances from James Millar (silken-voiced, despotic headmistress Miss Trunchbull), Elise McCann (divine Miss Honey) and Marika Aubrey and Daniel Frederiksen (Matilda’s ghastly parents, the Wormwoods). The kids are all a delight too, but Matilda has to be the shining centre. There are four girls playing our heroine in rotation, obviously not five-year-olds but several years short of teenagehood. I have seen two of them, Molly Barwick (10) at a preview and Bella Thomas (11) at last week’s opening night. They were very different and both enchanting. I very much want to see Sasha Rose and Georgia Taplin, obviously out of professional interest, and also because it means I get to see Matilda again.